Home to the federal government of Canada, Parliament Hill is one of Canada’s most recognizable landmarks, and is the focal point of Canada Day festivities. So it was a no-brainer to create this majestic ode to Canada in miniature, along with its very own light show! One of the largest and most challenging models built so far by our in-house team, Centre Block has been under construction since January of this year, with over a thousand working hours involving 10 members of the team. Designed and built by Mark Domanski, Surveyor of Signature Structures at Our Home & Miniature Land, the model leveraged various types of materials such as wood, plastic and foam in the creation of this iconic structure. With drawings used from the actual Parliament building sent to us by Public Services and Procurement Canada, the structure looks like the real thing, just a lot smaller of course. Mark standing proudly next to his design during the CTV Toronto shoot. 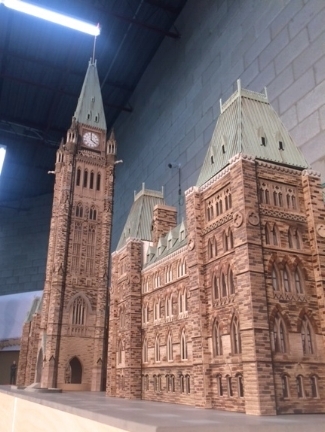 Similar to most of the structures, Centre Block is 1:87 scale with a footprint of approximately 5.5 ft x 3 ft and height from base to tip of 45 inches! Certain features of Centre Block were built using 3D printing technology such as the gargoyles and turrets situated on the Peace Tower, created by Objex Unlimited, a 3D printing company that collaborated with us on this structure. The Peace Tower will have a working clock and the animated feature of a working flagpole! The build of Parliament Hill continues with East Block, West Block and the Library of Parliament next in the construction plans. The team hopes to have Parliament Hill completed by the end of the year. Until then keep up with our progress through social media or check out photos of the Ottawa build on our website, www.miniatureland.ca.